The king is dead! Long live the king! Pacific Trading Cards may be gone but one of their most recognizable lines lives on. 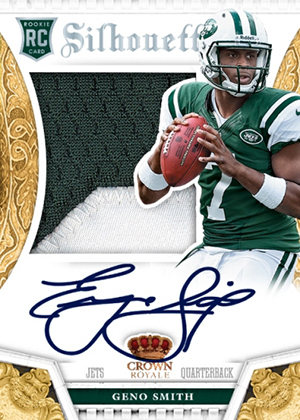 2013 Panini Crown Royale Football features some of the wildest and most distinct designs in the hobby. Led by the return of Silhouettes, hobby boxes have four hits and seven die-cut cards. Crown Royale has a couple of calling cards. On the high-end side is Silhouettes. 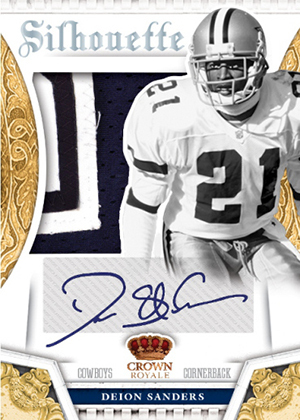 The autographed memorabilia cards have been tweaked a little for 2013 Panini Crown Royale Football. They hallmark of the die-cut player image layered over top of a large memorabilia piece remains. Rookie Silhouette cards include the 40 players from the Rookie Premiere and come with on-card autographs. Parallels include Gold (#/49), Green (#/25), Purple (#/10) and Blue (1/1). Veteran Silhouettes now come with on-card autographs as well. Parallels come with the same colors but are much more limited. Legendary Silhouettes feature retired players. While these use sticker signatures, they're tough to pull. All are numbered to 25 or less. Another piece from Pacific's past are the die-cut Panini's Choice Signatures. Rooted in a design from Pacific's heyday, Kramer's Choice, the pyramid-shaped cards come with an on-card autograph from both rookies and veterans. These have four parallel levels, all numbered to 25 or less. The entire 2013 Panini Crown Royale Football base set, which features 100 veterans and 100 rookies, has Crown Die-Cut parallels. These come in several colors: Silver (#/199), Gold (#/99), Holo Gold (#/25), Green (#/10), Purple (#/5) and Blue (1/1). 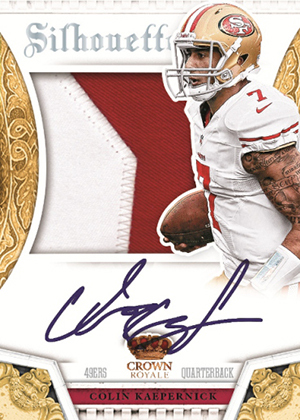 The release also has veteran and rookie Crown Die-Cut Autographs. Good: Silhouettes, cool die-cut insert designs, distinct theme throughout. Bad: Foil overkill, little has changed with the base set design. 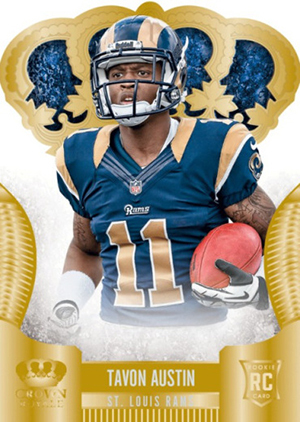 The Bottom Line: 2013 Panini Crown Royale is for fans of die-cut designs. You aren’t going to find many traditionally shaped cards. Some work, some aspects not much. Overall, though, most of them are pretty cool. It makes the product distinct and helps push a high-end feel even if it isn’t ridiculously expensive. It’s not exactly cheap, but it’s not National Treasures either. It’s called Crown Royale for a reason. Since it’s earliest days as a Pacific release, the brand has been largely defined by the die-cut muffin tops of the base cards. It’s distinct, it’s flashy and it might be time to change things up a bit. Maybe not abandon the die-cut, but how about a new look to the crown. For all intents, Pacific is dead. This is a Panini brand now. Why not opt for a different style crown. An episode of Game of Thrones, The Tudors or even the old He-Man cartoons offer plenty of options. There’s also a lot of foil on the base cards. A lot. Like so much I have to tilt them and get the light to hit them ever so perfectly to read the names. Unless its lenticular or a hologram, I prefer not to have to tilt my cards to get information. I wouldn’t mind if Panini’s Choice went away too. I doubt many people remember the Kramer’s Choice cards they’re based on anymore. And those that do are probably like me and ready to walk away. I get the consistency and nostalgia, but not everything about Pacific needs to be revisited. Those quibbles aside, I love just about everything else about the 2013 Crown Royale Football designs. But then again, I’m a bit of a sucker for die-cut cards. But if you were hoping for rectangles, you probably weren’t going with these based on the base cards. Silhouettes are one of my favorite inserts in the entire hobby, at least when they come with both a memorabilia swatch and an autograph. The Rookie Silhouettes here are some of my favorite I’ve seen. Another big plus in Crown Royale is how there’s consistency and flow between the various elements of the product. They’re all working in unison rather than coming across as a random assortment of cards. Yeah, it’s 2013 and right now nobody seems to be excited about the rookies. But Crown Royale still has a nice assortment of cards. Rookies, weak or not, are covered well. If one were to actually go for the full set, the breakdown is a little on the extreme side. Speaking of extreme, there are a ton of parallels. Player and team collectors might be divided on whether to chase them all, but if you’re just busting a box or two it isn’t too bad. Many of them are exclusives to either hobby or retail so you shouldn’t see lots of variety unless you’re opening lots of it or chasing singles. As mentioned, the mix of inserts is nice. Most everything fits the regal theme. Put together, it makes for a very cohesive set and a stronger brand. This is where the rookies really show up. 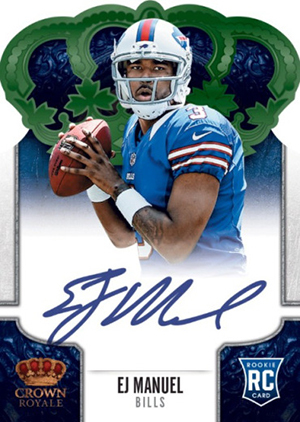 While there are lots of attractive cards in 2013 Panini Crown Royale Football, finding one that will bring a strong return versus the price is a little tougher. The Silhouettes certainly help. Even the lesser players bring better returns than many other comparable sets. It also helps that Crown Royale stratles between being a pricey product and something a little more mid-range. It’s certainly not cheap, but for a hit-per-pack product, it feels like a solid price given the look and feel of the cards. As long as your box isn’t loaded with single-color swatches, you shouldn’t feel too bad even if your hits aren’t the best players. 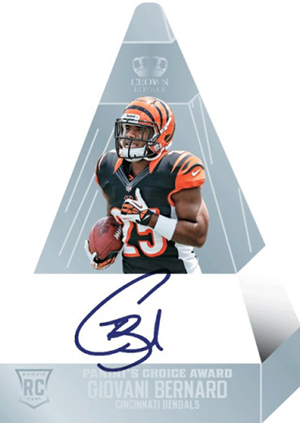 I enjoyed 2013 Panini Crown Royale Football quite a bit. Even if the base design is a little tired, it’s still distinct. I’m a big fan of the Silhouettes line as well. The defined theme that runs throughout the product added to my enjoyment and helped cover some of the packs where the big cards really weren’t all that big. That’s the power of a well-designed and thought out product. If you buy into the theme, it’s a lot easier to enjoy and stress less about what particular cards you might find. WAYYYY too much going on on those Silhouette cards this year. IMO 2011 had the best layout with the player in the middle of the card. I can understand them moving the photo to the left for more patch to show, but where is your eye drawn to when looking at these? All over the place! Glad they decided not to do the base cards and parallels horizontal this year though.